There’s no question the market has been on a downwards spiral the last few months. I’ve outlined the declines in almost every report. With foreign buyers heading for greener pasture, new lending policies making it tougher for locals, and an upcoming provincial election it’s hard to be optimistic about the short term future of Vancouver real estate prices. However, for some sellers it appears reality has not set in. Yet just the other day I showed a bunch of downtown condos to a prospective buyer. Every listing we saw was overpriced. In some cases I gauged they were over listed by about $50,000. It should come as no surprise the listings had been sitting on the market for awhile. It’s almost a certainty these overpriced condos were a result of an overly optimistic seller. We all know most Realtors are the first to suggest a price reduction. So what gives? It’s well documented prices take time to move. Although we have seen Multiple Offers Plummet on Downtown Condos and prices drop 5% since June, it could take some time for the needle to budge further. Buyers and sellers appear to be at a cross roads. The buyer refuses to overpay, and the seller still expects Spring 2016 prices. 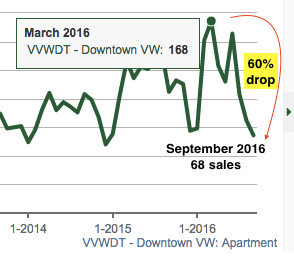 Perhaps that’s why we’ve had a 60% drop in condo sales since March. The same thing is happening elsewhere. Just the other day I spoke with a couple fellow Realtors. One had a detached listing in Richmond, the other a duplex in South Surrey. Both received below asking offers, or what the seller considers a “low ball” offer. But were they low balls? Now I can’t tell you the offer prices for obvious reasons but I can tell you the only homes that are selling are the ones willing to reduce their price significantly. For example, Richmond detached sales this month have sold on average $184,316 below asking price. Any seller holding out and hoping for a higher price in the spring could be left with a sour taste in their mouth. As I’ve mentioned previously in Time to Cash Out Vancouver Real Estate Profits. So what options does a seller have? Sell now and lock in your profits. Rent out your home and wait it out, Or roll the dice and hope for a miraculous rebound in 2017. Previous articleWhat is the ROI of Vancouver Real Estate?